Grease is the best. It’s a classic in the world of movie musicals. Everyone has seen it, or at least a scene or two, at some point in their life. But there’s a lot more to this 1978 film based on a musical set in the 1950’s than you thought. We all know that Jeff Conaway (RIP) played Danny Zuko on Broadway and John Tavolta was Doody, but did you know Elvis was offered a role? 1. Elvis was initially offered a role in the film. It is believed he would play the Guardian Angel role, but he did not accept. 2. Grease is the highest-grossing film of 1978. 3. In “Look at Me I’m Sandra Dee” they changed the reference and it has a freaky coincidence. In the stage play, the song had a reference to Sal Mineo, who was murdered in 1976. For the movie, they changed the lyric to “Elvis, Elvis, let me be! Keep that pelvis far from me!” In reference to Elvis Presley, who died the same day the scene was filmed. The day was August 16, 1977. 4. There is a little tribute to the Three Stooges in the film. 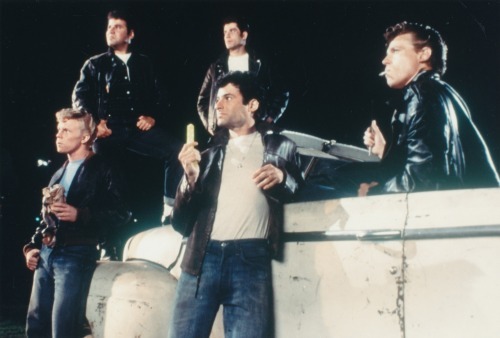 The boys who played Doody (Barry Pearl), Sonny (Michael Tucci), and Putzie (Kelly Ward) all went to director Randal Kleiser with their idea and got it approved for the film during the bonfire scene. 5. All of the cast members were too old for high school. John Travolta was 23, Jeff Conaway was 26, and Stockard Channing was 33 (older than Dennis C. Stewart A.K.A. Crater face or Leo, Leader of the Scorpions, who was 30). The two closest to high school age were Lorenzo Lamas (Tom) and Dinah Manoff (Marty), they were both 19. 6. A “Hickey From Kenickie” was 100% real. Stockard Channing said in an interview that Jeff Conaway insisted on applying the hickeys himself. 7. “Hopelessly Devoted to You” was written after filming wrapped. The producers felt that Olivia Newton-John needed a huge ballad for the film. This song actually ended up receiving an Academy Award nomination. 8. In the stage production, “Greased Lighting” is not sung by Danny. It’s sung by Kenickie, but John Travolta convinced the producers to let him sing it. 9. Danny’s blue wind-breaker was a nod to James Dean. Like his red wind-breaker from Rebel Without A Cause (1955). 10. Lucille Ball is the reason her daughter was not cast as Rizzo and the part went to Stockard Channing. Lucie Arnaz was dropped from consideration after Lucille Ball called and said “I used to own that studio; my daughter’s not doing a screen test!” But actually, she owned the studio Desilu which was bought by Paramount. 11. Cast members got sick from filming the drag race scene. When filming near the bridge, the water there was stagnant and dangerous, causing some of the cast to become ill from it’s filth. …the scene explaining it got cut. They filmed a scene, where the couple got into a heated argument, before the diner scene but it was pulled due to it’s grittiness. It was compared to something Martin Scorsese might have directed. 13. The first time John Travolta met Olivia Newton-John was at her house. He was a huge fan of hers (he basically was the #1 supporter of her being Sandy) and was very star struck when he met her, having not reached a huge level of success yet. 14. During the filming of “Greased Lightning” Jeff Conaway injured his back. And the injury led to his abuse of prescription medication and downward path. He was dropped by fellow cast members during filming. This information was not publicly known until Conaway’s appearance on Celebrity Rehab with Dr. Drew. 15. Olivia Newton-John’s pants were so tight when filming “You’re The One That I Want,” that the zipper was broken. She had to be sewn into her pants every morning. 16. John Travolta had to talk Olivia into filming that song. She admit on the Merv Griffin Show that she was terrified of it. 17. Jeff Conaway came up with the idea of how to blow off Danny and Kenickie’s hug. Conaway said that in 50’s, two guys hugging, “forget about it!” So he suggested that after, they comb their hair and pretend it never happened. 18. The film takes place in 1958. 20 years before the actual release date on June 1, 1978 (in the U.S.). 19. In the stage production of the show, Sandy’s last name is Dumbrowski. But because Olivia Newton-John was cast, they changed her background to match her Australian one. 20. One song cut from the film is actually played in the background. 21. It took a week to shoot the dance contest. They were on location in a real school at the time in downtown L.A. Originally Sandy was not intended to dance in this scene, it was meant to be just Danny and Cha Cha. It was reputedly 116 degrees during filming. Several extras suffered heat-related illness. 22. But it took only one day to film “You’re The One That I Want”/the end scene. It was filmed with a traveling carnival that was there only for the day. The next day, director Randal Kleiser wanted to film some extra close-ups, but the carnival had left, so they had to recreate pieces of that set to accomplish it. 23. Olivia Newton-John attended the premiere in a prom dress. And then for the after party, she changed into her “Sandy 2” look, which was hot pink spandex. 24. That plastic wrap moment in “Greased Lighting” is actually a reference to condoms. 25. There was a planned sequel, by the title Summer School, completely different from Grease 2. Paramount later nixed the idea and we sadly got Grease 2 in 1982. This orignal sequel plan grew out of Coach Calhoun’s line “See you in summer school” to a student before he is hit with a pie in the carnival scene near the end.